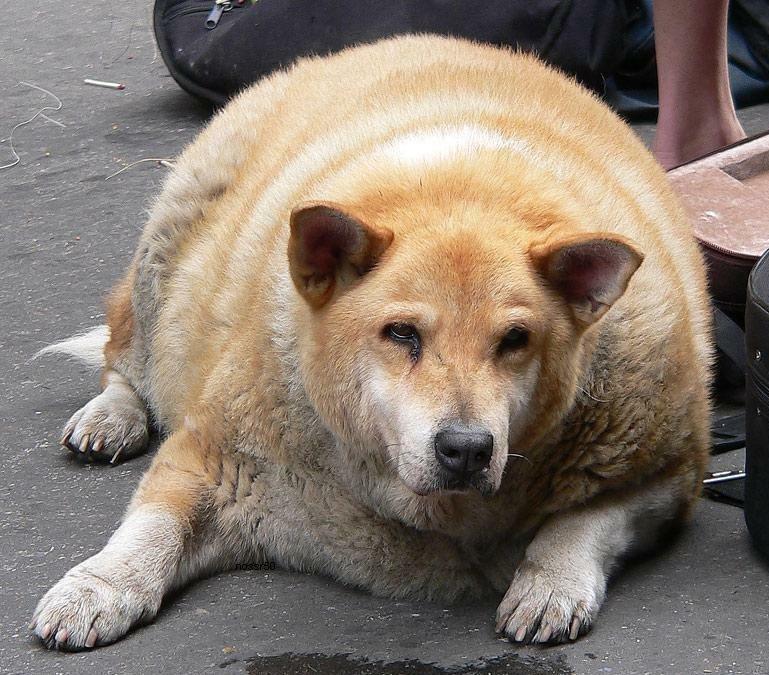 Obesity is rapidly becoming the most common veterinary condition affecting our dogs and cats. Estimates vary, but one survey found 53 percent of adult dogs and 55 percent of cats to be classified as overweight or obese. That equals 88.4 million pets that are too heavy according to veterinarians. 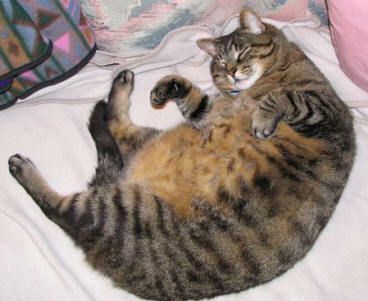 Overweight pets are at risk for serious health problems, such as Cancer, especially intrabdominal cancers, diabetes, liver disease, arthritis, skin disorders, heart disease, FLUTD ( Feline Lower Urinary Tract Disease), Immune system depression, High Blood Pressure and generally have a shortened life span. 1. Ribs, lumbar vertebrae, pelvic bones and all bony prominences evident from a distance. No discernible body fat. Obvious loss of muscle mass. 2. Ribs, lumbar vertebrae and pelvic bones easily visible. No palpable fat. Some evidence of other bony prominence. Minimal loss of muscle mass. 3. Ribs easily palpated and may be visible with no palpable fat. Tops of lumbar vertebrae visible. Pelvic bones becoming prominent. Obvious waist. 4. Ribs easily palpable, with minimal fat covering. Waist easily noted, viewed from above. Abdominal tuck evident. 5. Ribs palpable without excess fat covering. Waist observed behind ribs when viewed from above. Abdomen tucked up when viewed. 6. Ribs palpable with slight excess fat covering. Waist is discernible viewed from above but is not prominent. Abdominal tuck apparent. 7. Ribs palpable with difficulty; heavy fat cover. Noticeable fat deposits over lumbar area and base of tail. Waist absent or barely visible. Abdominal tuck may be present. 8. Ribs not palpable under very heavy fat cover, or palpable only with significant pressure. Heavy fat deposits over lumbar area and base of tail. Waist absent. No abdominal tuck. Obvious abdominal distension may be present. 9. Massive fat deposits over thorax, spine and base of tail. Waist and abdominal tuck absent. Fat deposits on neck and limbs. Obvious abdominal distention. In general, a good goal to aim for is 1-2% of the body weight per week. In practice I would typically calculate 15% weight loss, and aim for that in 3-4 months. Rapid weight loss can lead to rapid weight return, liver disease, and in some cases even hepatic lipidosis. I have always had the best results on elevated protein diets, which include at least 50% canned. Cats respond best to only canned cat food. Cut out the treats, especially the high carbohydrate one, commit to exercising your dog twice daily for at least 30 minutes, and feed only the measured amount of food based on your dog’s/ cat’s weight. Carnitine. This has been shown to speed up weight loss in cats. The dose is 250 mg daily. Carnitine is being included in some weight reduction programs because of its effect on the utilization of fat by the body. Dehydroepiandrosterone (DHEA), which has been shown to have antiobesity activity in rodents. A recent study at the University of Wisconsin School of Veterinary Medicine demonstrated that dogs receiving DHEA while being on a weight reduction program lost weight faster and had lower cholesterol levels than those dogs who were on a weight reduction program alone. Coenzyme Q10 is essential for energy production at the cellular level. It has been shown to benefit humans with various heart and muscle diseases. Again, studies of its effect on obese animals are currently underway. It has been shown to be safe, with no adverse effects demonstrated in animal studies according to Nutramax, a company which produces Coenzyme Q10 in an oral form for dogs, cats, and horses. Green Tea. Has gained popularity for weight loss, it is also a rich source of antioxidants, and safe to give daily. You can give it in the tea form – substitute green tea for your pet’s water, and assess the results in 30 days. Colostrum. Colostrum has been shown to help with weigh loss by increasing muscle mass. The increased muscle leads to increased metabolism, and loss of fat. Increasing numbers of athletes are using colostrum; it is a safe nutrient to consider adding to your overweight pet’s diet. Probiotics. These are the healthy bacteria which colonize your intestinal tract, and researchers are finding they are increasingly important for health, and that they may help with weight loss in people and pets. Daily supplements with the probiotic Lactobacillus gasseri SBT2055 may help weight loss in people with obese tendencies, according to new research. The study extends previous findings … which showed LG2055 may reduce fat levels (adiposity) and fat cells in animals”. P.S. If you liked this article, then I encourage you to sign up for my newsletter where you’ll get my Free Book and Videos on How To Heal Your Pets At Home with my TOP Natural Remedies. The big key to having a healthy dog or cat is also knowing WHAT to do to prevent common dog and cat diseases in the first place. Such as knowing what to feed, what vaccines to give and avoid, and what natural treatments you can use to treat chronic illnesses such as allergies. 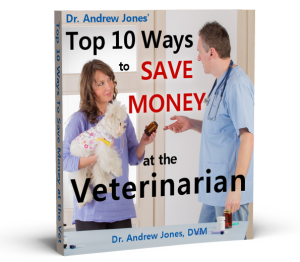 I’ll show you precisely what you can do immediately to both prevent and treat diseases in your dog or cat; you’ll be using my holistic tips and remedies with simple easy to follow instructions.